Flavius Valerius Aurelius Constantinus (c. 27 February 272 – 22 May 337), commonly known as Constantine I, Constantine the Great, or Saint Constantine, was Roman Emperor from 306 to 337. Constantine, a Roman, was destined for the college of Emperors but following the death of his father, he was hailed by the Legions in York as Augustus and became the Governor of Britain and Gaul. After several successful battles across the Alps and Italy he eventually established himself as the lawful Emperor of both the East and West and transferred the capital of the empire from Rome to Byzantium, later to be named after him. 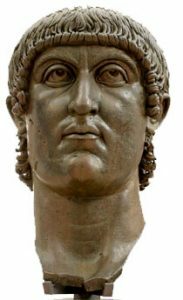 Constantine the Great is well known for being the first Roman emperor to convert to Christianity, Constantine reversed the persecutions of his predecessor, Diocletian, and issued the Edict of Milan in 313, which proclaimed religious tolerance of Christians throughout the empire. His conversion began one evening after a long day’s march with his army when, in what he believed was a sign from heaven, he and his army saw in the sky, and by the rays of the setting sun, a pillar of light in the form of a special cross. To sanctify the minds of his pagan army, he had made a standard bearing a Cross like that seen and ordered it to be carried before him in the wars. Several Christians in his army came forward and avowed their faith following which Constantine directed that they should wear on their armor a red cross. May I be no man’s enemy, and may I be the friend of that which is eternal and abides. May I never quarrel with those nearest me; and if I do may I be reconciled quickly. May I never devise evil against any man. May I love, seek and attain only that which is good. May I wish for all men’s happiness and envy none. May I never rejoice in the ill-fortune of one who has wronged me. When I have done or said what is wrong, may I nevery wait the rebuke of others but, always rebuke myself until I make amends. May I win no victory that harms either me or my opponent. May I reconcile friends who are wroth with one another. May I, to the extent of my power, give all needful help to my friends and to all who are in want. May I never fail a friend in danger. When visiting those in grief, may I be able by gentle and healing words to soften their pain. May I respect myself. May I always keep tame that which rages within me. May I accustom myself to be gentle, and never be angry with people because of circumstances. May I never discuss who is wicked and what wicked things he has done, but know good men and follow their footsteps. Eusebius of Caesara(about 260-330), a famous chuch historian. He was forced during persecution under Maximinus to flee for his life to Egypt, but returned, and in 313 was made a Bishop of Caesar. During the Council of Nice, he led the moderate party of Arians. The Emperor Constantine was the friend and admirer of Eusebius. 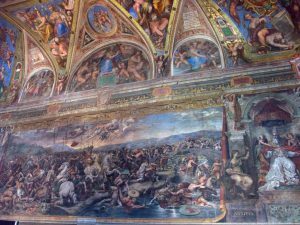 Among the works of Eusebius are the History of the World the Time of Constantine, and a History of the Christian Church to 324.